I forgot to say how much water to use in the marinade…please use 2 quarts (2 liters). Enjoy! Put the water, salt, sugar and spices in a large pot over medium-low heat until the sugar and salt have dissolved. Let it cool a bit, then let it cool completely in the fridge. If it's warm at all, it will end up cooking your beef, and we don't want that! Trim the fat off the corned beef, then place in a 2-gallon bag with the brine, making sure very little air is in the bag so the beef can be submerged in the brine. 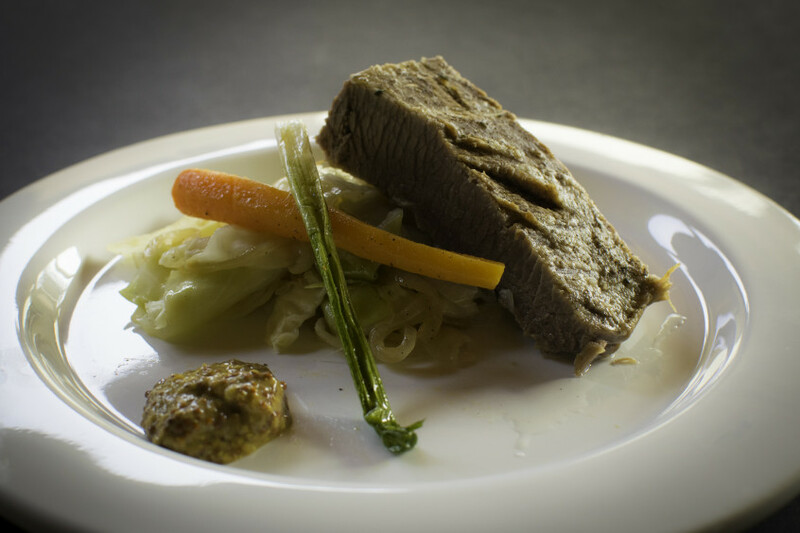 Place it in a baking dish and leave in the refrigerator for 5-7 days, turning the beef once a day. After 7 days, remove the beef, take it out of the brine, and rinse well under cold water. Place the beef in a large pot, and fill the pot with water until the beef is submerged about 2 inches. Roughly chop the carrots, celery, and onion and place in the pot with the beef and water. Let it come to a boil, lower to simmer, cover and let it cook for 3-4 hours, or until the beef is fork tender. Meanwhile, quarter your green cabbage, leaving the root intact. Slice your onions. 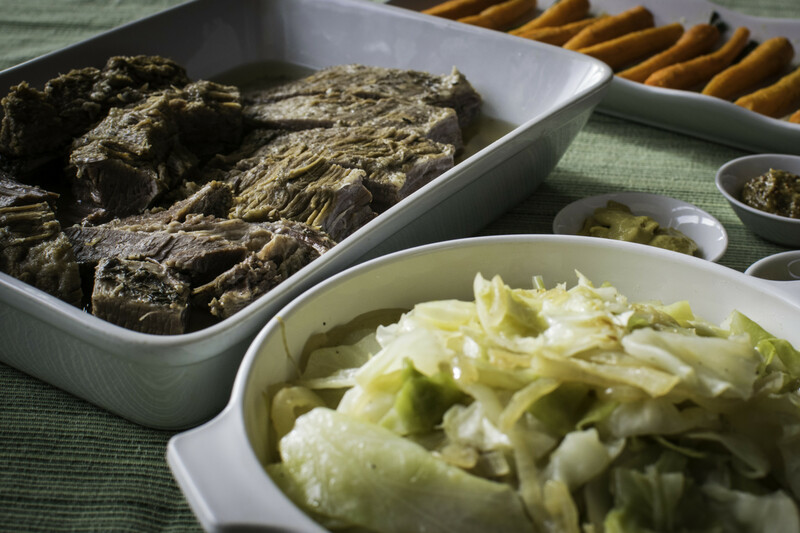 When the meat is almost done, place the cabbage in the pot, and let it cook for about 15 minutes. Fish out the cabbage and the beef. Let the beef rest on a cutting board tented with foil, and let the cabbage drain in a colander to get as much moisture off as possible. While the cabbage is draining, sauté the onion in the butter until it is soft and caramelized. Slice the cabbage, discarding the root, and add to the onion mixture. Sauté briefly until the cabbage is tender but not mushy. When ready to eat, slice the corned beef, place on a platter, and pour some of the broth on top to keep it moist. Serve with the cabbage on the side. We also like to serve it with roasted carrots. Enjoy! Just discovered you today via the rainbow slaw vid that you did with Jamie O. That looked so good I came over to your website and this corned beef was the first thing to grab my attention. Literally an hour before seeing this I was thinking that I needed to make some proppa corned beef, and hey presto!!! Never mind St. Patrick’s Day, I’ll be trying to fit this into my menus over the Xmas period, if I can. I’m pretty much already good to go with that, but I may be able to slot this in during the first week of the new year, if not before! Nice one Amber! I look forward to trawling through the site some more!! Welcome! Thank you so much! Definitely let me know if you try the Corned beef because it truly is mouthwatering!